Aguahoja is an exploration of nature’s design space. A collection of natural artifacts were digitally designed and robotically fabricated from the molecular components found in tree branches, insect exoskeletons, and our own bones. Here, we propose a novel water-based design approach and fabrication platform that enable tight integration between material synthesis, digital fabrication, and physical behavior, at scales that approach—and often match—those of natural ecologies. Nature made us half water. With water, and through growth and degradation, the biological world facilitates customization of an organism’s physical and chemical properties as a function of genes and environmental constraints. By contrast, the built environment is comprised of artificial, inanimate structures designed to perform a finite set of predefined functions. When their function is served or outlived, they become permanent waste in our landfills and oceans. Upon malfunctioning or degrading, the majority of plastics, woods, glass, and metals are never recycled. Specifically, more than 300 million tons of plastic are produced globally each year, leaving harmful imprints on the environment: our seas, our trees, and our bodies. Less than 10 percent of this material is recycled, and the rest becomes waste, dumped into landfills and oceans. Raw ingredients utilized by these materials are extracted from the earth faster than they can be replenished, and are processed using toxic chemicals that leach out of these goods as they degrade back into the earth over thousands of years. Derived from organic matter, printed by a robot, and shaped by water, Aguahoja points towards a future where the grown and the made unite. It embodies the Material Ecology design approach to material formation and decay by design, as well as the realization of the ancient biblical verse “from dust to dust”―from water to water. The Aguahoja project—comprised of completed works (Aguahoja I) and works-in-progress (Aguahoja II)—aims to subvert the industrial, vicious cycle of material extraction and obsolescence through the creation of biopolymer composites that exhibit tunable mechanical and optical properties, and respond to their environments in ways that are impossible to achieve with their synthetic counterparts. Aguahoja I includes three artifacts: an architectural pavilion, a library of material experiments, and a set of associated hardware/software and wetware enabling technologies developed by the Mediated Matter group. The Aguahoja I pavilion and associated artifacts were completed and exhibited at the MIT Media Lab Lobby in February 2018, prior to being acquired for SFMOMA’s permanent collection (Collection SFMOMA, Gift of the Artist.) The second pavilion and associated artifacts—Aguahoja II—will be debuted as part of Nature—Cooper Hewitt Design Triennial, co-organized by the Cooper Hewitt, Smithsonian Design Museum, and Cube Design Museum in Kerkrade, Netherlands. On view May 10, 2019 through January 20, 2020, Aguahoja II will revisit the design issues in the context of Material Ecology, the group’s design approach and philosophy. Works included in this project are digitally designed and robotically manufactured out of the most abundant materials on our planet—the very materials found in trees, insect exoskeletons, apples, and bones. Cellulose, chitosan, pectin, and calcium carbonate are combined and compounded with high spatial resolution over material tunability producing biodegradable composites with mechanical, chemical, and optical functional properties across length scales ranging from millimeters to meters. These water shaped skin-like structures (‘hojas’) are designed and manufactured as if they were grown; no assembly is required. Standing five meters tall, the Aguahoja I pavilion is composed of biocomposites constructed with varying degrees of stiffness, flexibility, and opacity acting as façade or ‘structural skin’ manufactured without components, the surface area of which is limited only by the robotic gantry—a continuous construction modeled after human skin—with regions that serve as structure, window, and environmental filter. At the end of its life cycle, when no longer useful, the structure can be programmed to degrade in water (e.g., the rain), thereby restoring its constituent building blocks to their natural ecosystem, augmenting the natural resource cycles that enabled its creation. This level of ‘environmental programming’ can in the future enable the construction of structures that modify their properties relative to the season: even small alterations to the molecular composition of biocomposites can have a dramatic impact on their design and their decay. The Aguahoja I artifacts represent six years of exploration into computationally ‘grown’ and robotically manufactured biocompatible material composites that together make up a ‘library’ of functional biopolymers. The artifacts in this collection are diverse in their appearance and structural make up and environmental behavior; yet they are all composed from the same components: chitosan, cellulose, pectin, and water. The wide array of forms and behaviors embodied in both pavilion and artifacts reflects the manner in which they are expressed in nature, where a material such as chitin can compose both the exoskeletons of crustaceans and the cell walls of fungi. In contrast to steel and concrete, the composites formed by these materials are in constant dialogue with their environment. Some artifacts exhibit dramatic changes in conformation in response to humidity and heat, while others darken or lighten as the seasons change. Some are brittle and transparent with a glassy texture while others remain flexible and tough like leather. Despite their emergent diversity, these artifacts share a common quality—in life their properties are mediated by humidity; in death they dissociate in water and return to the ecosystem. The Aguahoja I platform is comprised of a robotic gantry for 3D printing biomaterials where shape and material composition are directly informed by physical properties (e.g., stiffness and opacity), environmental conditions (e.g., load, temperature, and relative humidity), and fabrication constraints (e.g., degrees-of-freedom, arm speed, and nozzle pressure), among others. 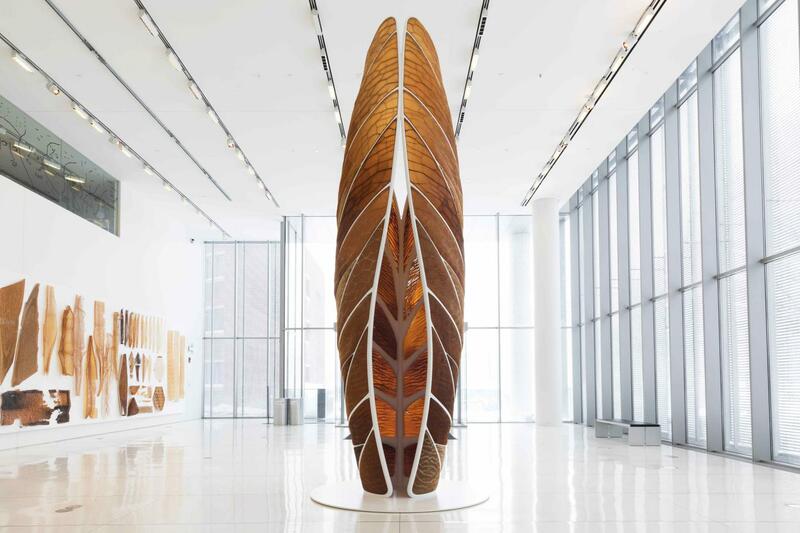 Entitled "Water-based Digital Fabrication," the platform fosters tight integration between form, function, and fabrication at scales that approach and often match the biological world. Flow-based Fabrication: An integrated computational workflow for design and digital additive manufacturing of multifunctional heterogeneously structured objects. Designing (for) Decay: Parametric Material Distribution for Hierarchical Dissociation of Water-based Biopolymer Composites. Designing a Tree: Fabrication Informed Digital Design and Fabrication of Hierarchical Structures. Towards Fabrication Information Modeling (FIM): Four Case Study Models to Derive Designs informed by Multi-Scale Trans-Disciplinary Data. Designing the Ocean Pavilion: Biomaterial Templating of Structural, Manufacturing, and Environmental Performance. 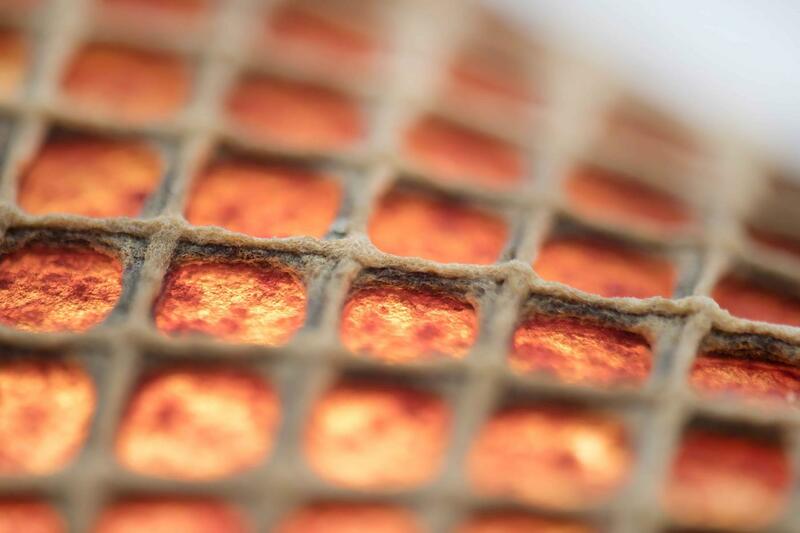 Parametric Chemistry: Reverse-engineering Biomaterial Composite Structures for Robotic Manufacturing.